Make Balsamic Caramelized Onions, set aside. In a food processor add crumbed feta cheese, blend until it resembles powder. Next add garlic clove, softened cream cheese, fresh rosemary, and fresh thyme to feta cheese. Blend mixture until smooth. Set aside. Form ground lamb into 6 equal small slider patties. Season both sides with salt and pepper. Heat grill to medium high heat or 400 degrees. Add lamb burger to grill and cook for 3-4 minutes per side. Remove burgers from grill. Toast slider buns for 1 minute. 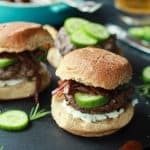 Assemble lamb burgers: bottom bun, 1-2 tablespoons of whipped feta, lamb burger, 3 slices of mini cucumber, 1-2 tablespoons of balsamic caramelized onion, top bun.